..it would be so nice, as Madonna might sing. Things are going to quiet around this neck of the Internet for a couple of weeks as I’m currently off on my hols. New posts when I get back! Perhaps you’re sat reading this blog at this very moment with a mug of tea or coffee nearby. Take a quick glance at it. Is the mug looking a bit worse for wear? Chipped at the top but you still keep using it out of habit? Maybe it’s time for a new receptacle for your choice of brewed beverage, and what better than a mug that has a bit of an Eighties theme, given you’re sat reading an Eighties themed website at this very moment? To the rescue come Hawkin’s Bazaar yet again. They are one of my favourite places for things that you thought were no longer available, and at the time of writing they have a number of retro TV mugs available at the offer price of 2 for Â£15 (or Â£10 each). These are no ordinary mugs though, as not only do they have pictures of some classic children’s TV characters, they also talk when you drink from them! 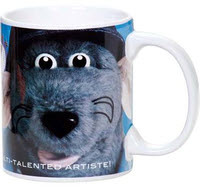 There’s one for Rat fans featuring Roland Rat Superstar, another of the Wombles from Wimbledon Common, one for Bagpuss and last but not least a whistling Clangers mug. Whilst writing about the dessert Blancmange the other day I was reminded of the band Blancmange, and it occurred to me that whilst I remembered them being a band, I couldn’t actually remember any of the songs they did. So a quick Internet search later and I bring to you Living On The Ceiling, a song I definitely remember and I hope you will too. If you’re not sure you do, then check out the video clip at the end of this post. 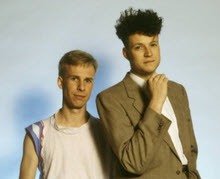 Blancmange themselves were a two piece outfit consisting of singer Neil Arthur and Stephen Luscombe, the synthesiser guy. They formed in 1979 and were fairly successful during the early Eighties, with them calling it a day in 1987. The pair did some solo work after that, but they recently reformed, and their fourth album, Blanc Burn, was released in March 2011. Living on the Ceiling is a catchy song (probably why I remember it), with some interesting lyrics (I’m up the bloody wall!) and a mix of good old Eighties synthesiser and the sort of middle Eastern music you always associate with busy marketplaces and belly dancers. Oh, and surprise, surprise, the video itself contains a lot of middle Eastern style imagery to boot. Can you remember the last time you ate Blancmange? I certainly can’t, and to be honest I can say I’m not really too sad about that either. 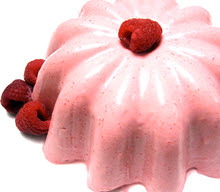 For me, Blancmange was one of those desserts that I secretly dreaded my Mother setting on the table at dinner time. I admit I ate it, because it was that or nothing, but I never would say I really enjoyed it. Basically a mixture of milk, sugar and gelatin or corn starch to make it set, it had a bit of a bland taste in it’s natural state, but when made in it’s pink (presumably strawberry flavoured) or yellow (banana) varieties it really didn’t taste that much better. Even chocolate blancmange didn’t taste that great either, which coming from someone who enjoys most chocolate based desserts shows quite how little I liked it. The closest I get to eating Blancmange now I suppose is in Trifle, which funnily enough is something I actually like a lot. Technically it’s a custard layer in Trifle, but it is sort of Blancemange-y, and is my least favourite part of the Trifle ensemble. The way I see it, that’s why you have the jelly and cream layers! The Whizzkid’s Handbook, written by Peter Eldin, was a book intended as a sort of guide to surviving school life. It basically consisted of a host of tricks, dodges, hints and tips to allow you to keep one step ahead of your teachers at all times, and (probably correctly) assumed that every school boy or girl in the country secretly wanted to be Dennis the Menace or Minnie the Minx. Whilst the majority of entries in the book would probably have had you sent to the headmasters office quicker than a very quick thing, they were certainly all amusing to read and at the very least wish you had the guts to do at school for real. The kind of things you might find included tips like how to fake an illness to get a day off school, excuses for why you hadn’t done your homework, ways of out smarting the school bully and so on. And that’s why fire engines are red! OK, some dodgy logic, and sadly no longer true thanks to the Russian flag bit at the very least, but once you’d memorised all that it was one of those great ways of impressing your mates in the school playground. The book proved incredibly popular, so much so that there were two further volumes published. Child of the 1980’s – The Store! 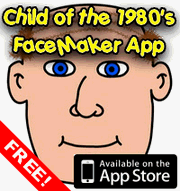 Introducing our latest money making scheme feature, the Child of the 1980’s Store! Ever been stuck for a present idea for an Eighties mad friend? Want to track down that favourite film from your youth? Want to line the pockets of the author of this site? If the answer to any of the above is “Yes” then rejoice, for here is the answer to your prayers! We’ve scoured the pages of Amazon to find you loads of cool Eighties goodies, including books, DVDs of films and TV series, toys, games and music, many at bargain prices! Go on, you know it makes sense, as Del Boy would say. Those nice people at Amazon have allowed me to pull out some select products from their vast range and present them to you with a nice little shop front. If you buy anything from here then I get a small backhander payment too, which helps towards keeping me in Galaxy Counters this site running. Here’s a show that I’m sure many of you will have forgotten about until reading this. Luna was an ITV childrens Sci-Fi show, which given it was also a comedy still had a surprisingly dark streak to it. The year is 2040, and the Earth as we know it has become an uninhabitable mess through pollution, nuclear war and God knows what else. People know live in the Efficiecity, a completely enclosed environment kept safe from the ravages of the outside world. People no longer live in traditional family groups, but instead are made artificially in “batches” and are then sent to live in artificial families in homes known as Habivirons. The show is named after the main character, a young girl, or “female diminibeing”, who gets named Luna by the other members of her forced household, although her real name is the decidedly unflattering 72-batch-19Y. The other members of the group are Gramps, who is an aging punk who still remembers what the world used to be like, Andy, the habiviron’s android, Mother, the habiviron computer, and Brat, a young boy who’s name is fittingly given to him by Gramps – though Brat doesn’t know what the word actually means! Luna was created by ex-Monkee Mickey Dolenz (who was also behind the Metal Mickey TV series) and was written by Colin Prockter and Colin Bennett, who also played Andy (and was the Mr. Bennett from Take Hart too). Luna was played by a young Patsy Kensit in the first series, and Joanna Wyatt in the second series, whilst Brat was played by Aaron Brown, who later appeared in the BBC kids drama Seaview alongside Blue Peter presenter (and now Most Haunted star) Yvette Fielding.